A vertical market is a market in which vendors offer goods and services specific to an industry, trade, profession, or other group of customers with specialized needs. ... Their similar products/services tend to be less of a fit but also less expensive than specialized, vertical participant solutions. 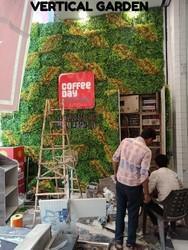 Vertical Garden Service is provided by us and executed by our hard-working professionals. We are offering Vertical Landscape Gardening Services For Apartment.